It's slightly irritating that we're here at all. 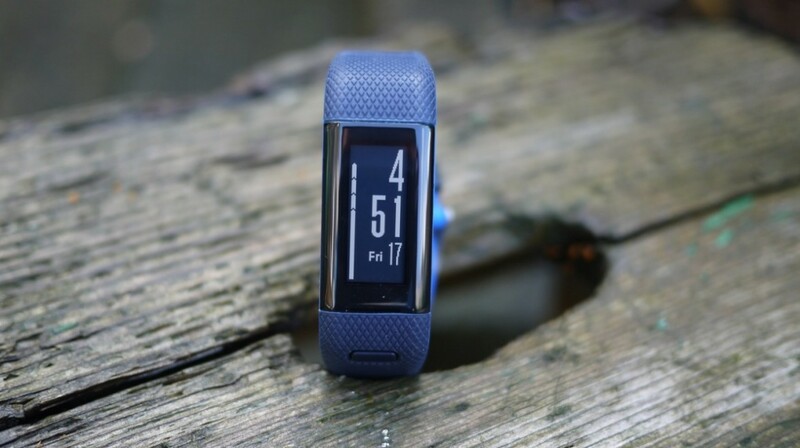 When we reviewed the Garmin Vivosmart HR we lambasted the lack of GPS for proper fitness fans. While it's great that an option has now arrived, it leaves us questioning why the two versions weren't released together. If we'd bought the Vivosmart HR and were making do with carrying our phones on runs, we'd be pretty pissed about Garmin sneaking out the updated version. For those who've just joined the party, the Garmin Vivosmart HR+ is essentially a Fitbit on steroids. An activity band with 24/7 optical HR and GPS built in, it has the specs to be the strongest fitness tracker on the market. But how does it stack up? Read on to find out. We received our Garmin Vivosmart HR+ in blue, and in our opinion this model is a huge visual upgrade to the original. The two-tone texture looks really smart, and it doesn't look out of place at work or at home. It's a tad chunky on the wrist, and it's certainly thicker than the likes of the Fitbit Charge HR and Jawbone UP3. However it does boast a proper screen for reading your data, which is surprisingly plentiful given the tiny real estate. Guys will find the thickness and size fine, but we'd advise ladies to think carefully if you're looking to wear it every day. It's chunkier than expected, and a couple of snap polls divided opinion on its day-to-day wearability. The screen itself is a small 160 x 68 pixel monochrome affair, which is fully touch enabled. It's pretty low res and hardly eye-catching, but we have to say it does the job well. The lack of sharpness and backlight isn't as much of an issue as it is on the larger Garmin Vivoactive HR, where the display tends to mar the overall look. You can swipe through screens on the Vivosmart HR+ home screen, from the always on time to daily steps, stairs climbed, active minutes, calories burned, distance travelled, music controls, weather (with the chance to tap for an hour by hour breakdown), notifications (which can be read in full with a tap) and heart rate (which you can tap to see the last four hours in graph form). When you consider the breadth of data readable on a screen that measures less than 1 inch, it's an incredible piece of design. What's more, it's inherently useable, easy to swipe through and intuitive. There are some clever people at Garmin, and they're pioneering solutions to some of the issues that have plagued the wearable industry. The final big spec is the waterproofing. Like most of the Garmin range, the Vivosmart HR+ is "water resistant" to 5ATM (around 50 metres), which means it's good for the pool, despite it having no dedicated swimming mode. The Garmin Vivosmart HR+ has three main features: GPS run tracking, smart notifications and daily activity tracking. And the latter is one of its strongest suits. Step tracking is accurate and is pitched against a moveable goal that Garmin sets for you. It takes a few weeks for this goal to settle down, but it does a good job of being both achievable in the short term, yet keeping you on your toes in the long term. If you'd rather set your own goal then you can do this within the app. All-day heart rate tracking is also decent, and it will keep tabs on your bpm 24/7. It uses this data to pull out your resting heart rate, which is a great indicator of your improving health. You can see this over time in the Garmin Connect app, and live on the wrist by swiping on the Vivosmart HR+. In short, as an activity tracker the Vivosmart HR+ is a fantastic and accurate device. While it's chunkier and less of a looker than the Fitbit Alta, to pick one example, it's filled with rich data which is guaranteed to delight. Sleep is tracked automatically and recorded in the Garmin Connect app, which also displays your preferred bedtime, so you can see how often you're hitting the hay on time, as well as how long you sleep. We found the sleep tracking to be generally accurate, with night time toilet trips recorded, but if sleep is your obsession, you might want to pick a tracker which reports slumber better. The graphs supplied in Garmin Connect are nowhere near Jawbone's or Withings'. If inactivity is your biggest bugbear then the Vivosmart HR+'s Move bar feature works well. It builds up on the home screen, and when it fills the screen you'll be prompted to move. It works better than most fitness trackers, as you can see inactivity building, which means you can get up and about before you get the nudge – because let's face it, these never buzz when you're actually free to move. The only gripe we have with the Move bar is the types of activity that enable you to clear it. You have to be up and about for two minutes, but we found that only walking around would actually clear it. We played two minutes of office football keepy-uppy which made no impact on the bar, and even two hours of floor sanding at home didn't make an impact. Unless you're walking purposefully, that Move bar ain't budging. This is the big one. While its predecessor required a smartphone to be carried along on your runs in order to leach the GPS, the Vivosmart HR+ can do things all on its own. Just press the button and choose the activity icon and tap Run to start tracking. Like any normal GPS watch it will track pace, distance, calories and time. It just displays one metric at a time, which is a tad annoying, but it's easy to swipe between them. However, those looking for a host of multisport options will be disappointed. The only modes are running (with an option for no GPS indoor running), cardio (which is an open workout, again with options for GPS) and 'other' (which is an open workout, again with options for GPS). There are no dedicated modes for swimming or cycling, which is slightly surprising. Of course, you can track these through the open workout option – just as you could hit the gym or a Zumba class – but the data that's returned is a little generic. You get distance (in GPS mode), time, bpm and calories burned, but no specialist metrics. In terms of the heart rate monitor, the Garmin Vivosmart HR+ followed a similar pattern to the rest of Garmin's recent devices that use the Elevate sensor. At a steady run pace it's mostly fine, but at higher intensity things start to break down. At high intensity and factoring in wrist flexing, the accuracy stumbles to a surprising degree. There's also a worse lag than we've seen on TomTom optical HR sensors. Unlike other Garmin devices, the Vivosmart HR+ doesn't support external HR chest straps for those who want more accurate data. This is a real shame given that pretty much every Garmin going will sync up with a strap. This underlines that the Vivosmart HR+ is a fitness tracker with some extra smarts for runners, and not the ultimate training tool. If you're worried about accuracy, you'll have to look at the Forerunner range. The Garmin Vivosmart HR+ can also broadcast heart rate to other Garmin devices. This is pretty handy for those with VIRB cameras or Edge cycling trackers to add biometric data into videos or rides, but somewhat of a niche feature. Garmin's is one of the strongest ecosystems when it comes to notifications and the Vivosmart HR+ is no different. When paired with your phone it will throw any notification that appears onto your wrist. It works 100% of the time, and is one of the most infallible notification systems we've seen outside of Android Wear smartwatches and the Apple Watch. Basically, it won't let you down. Some messages can be read in full, and you just tap to load the next part of the message on the device. Other messages (specifically Gmail emails) are trimmed, but you'll always get a decent handle on what's happening before deciding whether to pull out your phone or not. You can retrieve the last three notifications received at any time by scrolling down through the main menus. The Vivosmart HR+, like all other Garmin devices, syncs with the Garmin Connect app. It works with both Android and iOS and there's a web portal too which works with devices connected to a PC/Mac, meaning there's no need to have a specific smartphone OS to use devices effectively. Garmin Connect is a place to review graphs and charts that track your activity, and features a host of Snapshots, which are the first thing you'll see when you open the app. Snapshots include your daily stats, steps for the week, workout leaderboard and a calendar of workouts. It takes some getting used to, but it's a powerful app that's excellent at keeping track of all your different Garmin activities. The web portal is even better, offering a host of powerful tools to build workout plans, training schedules, make and plan routes and check your progress against goals. Once you get used to it, the app works well – but it's taken us a long time to work out where every option lives within Garmin Connect. When you find what you're looking for, however, the graphs are as detailed and accessible as any other fitness tracker we've tried. We said that Garmin had some clever people in its development teams, and that talent is no more evident than when it comes to battery life. The Vivosmart HR+ will last around six days with full notifications and workout sessions. It's impressive longevity that really crowns a top performance. *Correction: In the original article we said that the Vivosmart HR+ supported ANT+ chest straps. While the Vivosmart HR+ does support ANT+, it does not include HR straps. The Garmin Vivosmart HR+ is one of the best devices we’ve seen for runners who want more from their fitness tracker. If you’re even a half serious runner, the Vivosmart HR+ trounces Fitbit’s line-up, offering serious run tracking along with powerful daily activity stats. There are limitations, however. The Vivosmart HR+ has been left a little short of dedicated sports to track, with running the only named activity. In this respect we would like to have seen cycling and swimming added, but that’s the only blemish on a top fitness tracker worthy of your cash.